Report Cards handle all sorts of averages and compilations of student data that aren’t reflected anywhere else (except for maybe Transcripts). As such, if you want to see information like semester or final averages, report card comments, GPA, or grades for subject specific criteria in a handy summary report, you’ll want to run one of our reports that give you information from your report cards. Here are some quick tips on best practices for keeping your report cards in shipshape for reporting and some tips on how to setup your report cards so you can run reports on them quickly and easily. Let’s start by touching on how Report Cards work with Reports – and how to make working with both as easy as possible. While the reports are capable of displaying all sorts of information, what’s actually available depends on how you setup your report cards. For any given report session (batch of report cards), the data that’s saved so that you can run reports on is only what’s visible at the time when you lock the report card. For example, if your report card is setup to only show letter grades, you will need to take take some extra steps for showing numerical averages on your tabular reports at the end of the year. Consider at the beginning of the year which reports you want to run at the end of the year – this extra step allows you to setup your report cards throughout the year so that you don’t have to do anything special at the end of the year. Use the Report Card switches after locking the report card – The report card data (marks, grades, GPA, etc.) is already saved at this point, so you can play with what you see without affecting what information is saved to your database. This allows you to run reports on fields that you might have hidden. Give your report sessions identifiable names – Report card data is saved to the individual sessions you make and many report card reports ask you to pick a report session for displaying data, so it helps to name these clearly. For example, “Semester Report Cards” might be a good name, but “Semester 1, 2014-2015 Report Cards” will probably be better for reporting on these report cards. Now, let’s take an example scenario to go over how to setup report cards so that running report cards is as easy as possible. Setup Report Cards menu screenshot. Go here to configure your template! 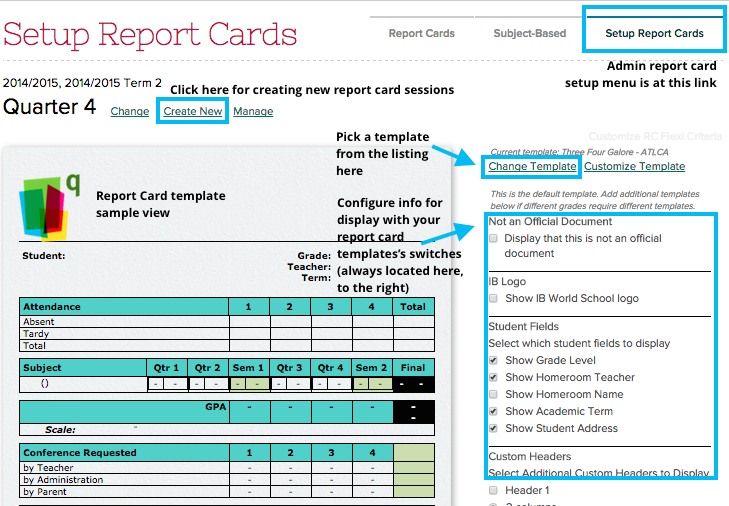 Create your report cards for Quarter 1. Make sure they show both marks and grades during setup. Lock your report cards for Quarter 1. Go to Report Cards –> Setup Report Cards, then use the switches to the right of the template to hide the letter grades for your template. Create your report cards for Quarter 2 / Semester 1. If you opt to ‘Copy Setup’ from the prior term, be sure to go to Setup Report Cards and turn the Letter Grade option back on. Lock your report cards for Quarter 2 / Semester 1. Go to Report Cards –> Setup Report Cards, then use the switches to hide the letter grades. Now, since you’ve saved data for the report card, you can run reports on it! Here’s how to do that. Hopefully, this helps outline how to work with Report Cards and Reports! Of course, if you have any questions or comments, please feel free to chat in. We’d love to help out any time.